BLUE BOAT to the rescue! Back in July, we were pleased to announce that Kersten Hamilton's 2008 picture book, RED TRUCK, was going to have a sequel, YELLOW COPTER. Today, we are pleased yet again, because Kendra Levin at Viking has just signed a third book, rounding out the trilogy with a vehicle on water that is the third primary color: BLUE BOAT. This time, a persistent little tugboat saves the day on stormy seas. We've just seen illustrator Valeria Petron's sketches for YELLOW COPTER, and it is going to be just as adorable as RED TRUCK--as will BLUE BOAT, we're sure! Congratulations, Kersten, on sealing the deal for the rest of the trilogy! Luke Reynolds Breaks Out with a Novel Debut! Many of you are well-acquainted with Luke Reynolds, not only for his witty persona and his moving blog posts, but also because he was the editorial force behind the ground-breaking essay collection, BREAK THESE RULES, which came out this year from Chicago Review Press. Our Luke, however, is a man of many talents, and I am thrilled to be able to spotlight another of these today: NOVELIST! His contemporary MG novel THE LOONEY EXPERIMENT tells the story of young Atticus Hobart, chronicling his own hero's journey as he tackles bullying, first love, and an up-close examination of the meaning of courage. The story is packed full of humor and quirky characters, but more than anything it's a story that lingers—it's moving, warm, and one from which you come away looking at the world a little differently. Needless to say, this book has grown very close to my heart, and I'm over the moon to share that it has found the perfect publishing home. THE LOONEY EXPERIMENT has been acquired by Jacque Alberta, for the brand new Blink imprint, a mainstream teen division of Zondervan Books. You can expect to find the book on shelves in late summer 2015. Hip hip, hooray—and a huge congrats to Luke! A STARRED Review for Bluemle! 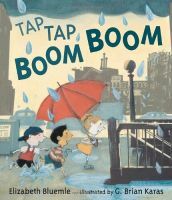 It's a starred review for Elizabeth Bluemle's Tap Tap Boom Boom in Publisher's Weekly! The perfect news on a cold, wet, winter's day. Congratulations, Elizabeth and illustrator G. Brian Karas!